It's finally here! For this season's stitch school I am trying something a little different, which will be to focus on a type of stitching instead of just a bunch of more or less random stitches. This is still all about the stitches, of course, but I will pick stitches traditionally used for crewel embroidery. At this point I am not entirely sure how many weeks I will run this, but I promise you at least 6, not including this introduction. So, the first question is what is crewel embroidery? I read up a bit to see what today's embroiderer's say about it. There are basically two opinions. The first is that it is defined by the type of yarns chosen, ie 2-ply wool yarns of varying thicknesses. The stitches are a bit secondary, as many types of stitches can be used. Other embroiderer's are a bit looser with the definition and think it's ok to use other types of threads as long as you are using stitches fairly typical to crewel embroidery. I am not taking a side in this debate, but in this stitch school, I am sticking with wool mostly because I enjoy them and because they sit a bit higher on the fabric since they are generally thicker than other threads - some think this is an important component of what crewel embroidery is. A crewel-type project, but with cotton threads. Crewel embroidery has a very long history. The Bayeaux tapestry stitch about 1000 years ago is considered a crewel embroidery. The embroiderers used only 8 colors to create this magnificent embroidery. It's definitely worth a look at. I took a quite peek at a book about in the library the other day, and they really made interesting use of the stitches to create textures and lines. Crewel embroidery has gone in and out of fashion. In the 17th century is was popular and is often called Jacobean embroidery. Many of you may think of the 70s when you think of crewel with its browns and oranges and avocado greens when this type of stitching enjoyed a bit of popularity. Today's crewelers have a multitude of patterns to choose from traditional to contemporary. 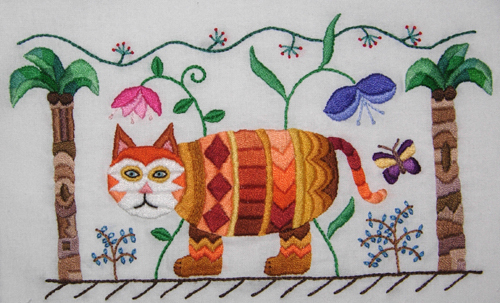 There really isn't any rule for what type of design can be used in crewel embroidery. And really, you can make any type of pattern into a crewel project by the threads and stitch choice. 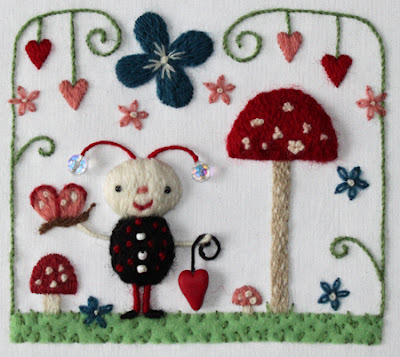 Ladybug project stitched with Appleton crewel wools. As far as fabric choice goes, there are many options. Often linen or linen-cotton blends are chosen because they have a looser weave so there is a little more room for drawing the needle through the fabric. In Sweden, they just call it wool embroidery rather than crewel, but it really is a type of crewel embroidery, but it is quite common to use thick wool felt to stitch on. The stitches are divided into 6 categories: outline stitching, satin, couched stitches, seed stitches, french knots, and long and short (some people call this soft shading). I will go through these 6 types in the following weeks. Outline stitching and couched stitches have the most variation as far as types of stitches, the others are just one type of stitch. Crewel embroidery often uses a mix of stitches and filling and lines to create interest and textures. I will try to highlight some of the possibilities with these stitches in the coming weeks. Hopefully you will get inspired to try a bit of crewel yourself!! I look forward to these posts. I have a bit of love/hate relationship with crewel due to a kit I bought that I really struggled with, then ran out of most of the colours! It's something I definitely want to try again,.